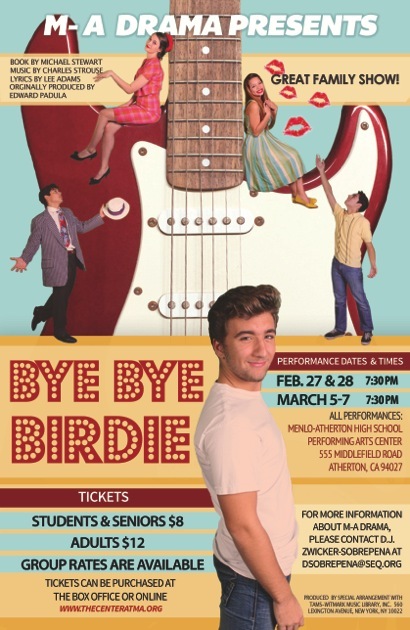 People of a certain age know all about the inspiration for Conrad Birdie, the hip-thrusting rock and roll superstar who gets drafted into the Army in the musical Bye Bye Birdie, which debuted on Broadway in 1960 and won a Tony Award for best musical in 1961. It was, of course, Elvis Presley, which leads us to this question: How can a young actor relate to that today? We came seeking an answer from Andrea Gaini, who plays Conrad Birdie in Menlo-Atherton High School’s winter drama production which premieres at 7:30 tonight at the Performing Arts Center. When he returns to Italy, Andrea thinks he may pursue drama over water polo. “That I got this role and am really, really enjoying it may end up being an important turning point in my life,” he says. One thing we couldn’t help but notice was Andrea’s Conrad/Elvis style hair, which we presumed he’d grown for the part. We were wrong. “This is how I’ve always had it” was his reply. We’re guessing he’s been channeling 50s American rock and roll longer than he realizes! There will be five performances of Bye Bye Birdie, all at 7:30 pm. In addition to tonight, the musical will be performed on Saturday, Feb. 28, and then March 5-7. Tickets are $12 for adults and $8 for students/seniors. They can be purchased at the box office one hour before curtain or online.